Romantic Circles is pleased to announce the publication of our newest Praxis volume, Circulations: Romanticism and the Black Atlantic. This volume moves the perspective of critical inquiry into British Romanticism from the Island (England) to the Islands (West Indies), considering the particular significance of the Atlantic—watery vortex of myriad economic and cultural exchanges, roaring multiplicity of agencies, and vast whirlpool of creative powers. Black Romanticism remembers a forgotten ancestry of British culture, recovering the vital agencies of diasporic Africans and creole cultures of the West Indies. It does so by practicing counter-literacy, reading the works of nation, empire, and colony against themselves to liberate the common cultures they occlude. The five essays presented here examine texts by or about Jean Jacque Dessalines, Juan Manzano, Jack Mansong, Mary Prince, and John Gabriel Stedman, following a circuitous route that begins in Africa and travels from Haiti, Jamaica, Cuba, Suriname, Bermuda, and Antigua to corresponding points in England, America, and the continent. The circulation of radically different adaptations of the “same” material provides new ways to understand the colonial Caribbean. This volume is edited and introduced by Paul Youngquist and Frances Botkin, with essays by Lindsay J. Twa, Lissette Lopez Szwydky, Joselyn Almeida, Dustin Kennedy, and Michele Speitz. We are pleased to announce the publication of Romantic Frictions, a new volume in the Romantic Circles Praxis Series. Romantic Circles is very pleased to announce our newest volume in the Romantic Circles Praxis Series: John Thelwall: Critical Reassessments, edited by Yasmin Solomonescu. Capitalizing on the conjunction of renewed scholarly interest in Thelwall and new archival finds, this collection of essays addresses the central question of the coherence and continuity of Thelwall’s diverse pursuits – literary, political, scientific, therapeutic, elocutionary, and journalistic – across the four decades of his career (c. 1790-1830), and provides new insight into Thelwall’s eclipse and persistence in the nineteenth century. The volume includes an introduction by Yasmin Solomonescu and essays by Nicholas Roe, Mary Fairclough, Molly Desjardins, Emily Stanback, Steve Poole, Angela Esterhammer, and Patty O’Boyle. The first, John Thelwall in Performance: The Fairy of the Lake, documents the first full production of a Thelwall play, his Arthurian romance The Fairy of the Lake. An introductory essay by Judith Thompson offers historical and literary context for complete footage of the play’s performance in Halifax in 2009, while a series of short video documentaries by Brooke Fifield explores the process of bringing this piece of radical Romantic theatre from dusty page to modern stage. The second, John Thelwall in Time and Text, combines a detailed chronology of Thelwall’s life with the fullest bibliography to date of his works, letters, and manuscripts, including archival locations and sources. Together, these three components of John Thelwall: Recovery and Reassessments seek to advance Thelwall studies by reconnecting text, voice, and image in the dynamic way for which Thelwall himself was renowned. We are pleased to announce the second part of an eight-part electronic edition of the Collected Letters of Robert Southey. Part Two is edited by Lynda Pratt and Ian Packer. Robert Southey, as many of our readers know, was one of the best-known, controversial and innovative writers in late eighteenth- and early nineteenth-century Britain. Based upon extensive new archival research, this Collected edition makes available for the first time all his surviving letters, freshly edited, annotated and introduced. Part One covers 1791-1797, turbulent years which saw the forging of Southey's career and reputation, his involvement in radical politics, and the beginning of his friendships with Wordsworth and Coleridge. Part Two, which covers 1798-1803, includes his public and private responses to Lyrical Ballads (1798); his reaction to the rise of Napoleon and the continuing conflict between Britain and revolutionary France; his second and final visit to Portugal and the resultant hardening of his anti-Catholicism; his unhappy stint as a secretary to the Irish Chancellor Isaac Corry, and his emotional bludgeoning by the deaths in relentless succession between 1801-1803 of three Margarets, his cousin, mother and first child. Part Two comprises 596 letters, of which 199 are published for the first time, and 107 are published in full for the first time. In addition, 5 letters that appeared pseudonymously in the Monthly Magazine are here newly attributed to Southey. Romantic Circles recently received a correspondence alerting us to the state of disrepair into which the headstone of Margaret King Countess Mount Cashell, a pupil of Mary Wollstonecraft and friend to Mary Shelley, has fallen (see photo). Buried next to her husband, George Tighe, in the Old English Cemetery at Leghorn in Livorno, Italy, King's grave site, along with most others in the cemetery were, until recently, covered with vegetation, earth, and roots. A group of volunteers began cleanup of the entire cemetery last year. The graves span the years 1600 to 1838 when the cemetery was closed. The chief volunteer, Matteo Giunti maintains a blog chronicling their restoration efforts. More information about King can be found on her Wikipedia entry. The letters span the period from 1797, when Mary Jane Vial's daughter was conceived, until early 1814. They were formerly held by Dodson and Pulman, Solicitors of Taunton, Somerset, UK. The collection comprises holograph letters from Mary Jane Vial to her former lover John Lethbridge, of Sandhill Park, Somerset; to his lawyer Robert Beadon; and to several others. It also contains letters from Lethbridge to his lawyer, and sundry file notes and correspondence from Mary Jane Vial's lawyer William Lambert White, of Yeovil. The correspondence is concerned with securing financial support for Mary Jane, Vial's daughter with John Lethbridge. It includes a number of letters written by Vial between April and August 1799, when she was imprisoned for debt at Ilchester. The documents are archived at Somerset Archive and Record Service http://www1.somerset.gov.uk/archives/, catalogue reference DD\DP 17/11, Papers of Dodson and Pulman, Solicitors of Taunton, Lethbridge estate papers (correspondence concerning Mary Jane Vial). Please be aware that I am not a Romantic scholar or historian (I am an alumnus of the the University of Queensland but my professional experience is in disability policy and program development). I have a keen amateur interest in genealogy, and came across this collection while researching an ancestor also named Mary Vial. As a consequence, my website may well not meet the Romatic Circle's rigorous standards for electronic resources. Nevertheless, I would be pleased if you would take whatever steps you consider appropriate to advise your members and readers of the existence of this previously unpublished material. I am sure it will be of interest to many. I would also be very glad to receive any criticisms of the content of the website and suggestions for its improvement. Thoughts in Prison, in Five Parts, was written by the Reverend William Dodd in 1777, while he was awaiting execution for forgery in his Newgate prison cell. Blandly Miltonic in style, the poem is unique not only among prison writings, but also in the history of English literature: none of the many reflections, stories, essays, ballads, and broadside "Confessions" originating—or purporting to have originated—in a jail cell over the last few hundred years can begin to match it in length (over three thousand lines of blank verse), in the irony of its author's notoriety (Dodd had been a chaplain to the king), or in the completeness of its erasure from history after a meteoric career in print that began to wane only at the turn of the nineteenth century. It is a document deserving attention from anyone interested in the early movement for prison reform in England, the rise of 'natural theology,' the impact of Enlightenment thought on mainstream religion, and, of course, death-row confessions and crime literature in general. An appendix presents manuscript versions of Samuel Taylor Coleridge's "This Lime-Tree Bower, my Prison," by way of suggesting a reliance, at least metaphorically, on this major work of prison literature by Romantic writers. This edition complete with Introduction and Appendix is available here. The Keats-Shelley Association of America's annual awards dinner at MLA will be held this year on Saturday, 8 January 2011. A cash bar opens at 5:30 PM and dinner begins at 7:00 PM, at the Standard Hotel Downtown Los Angeles, 550 S. Flower at Sixth Street. This year the Association will honor distinguished scholars Christopher RIcks and Julie Carlson. Romantic Circles is please to announce the publication of Editing and Reading Blake, a new volume in our Praxis series. Co-edited by Wayne C. Ripley and Justin Van Kleeck, this collection of essays looks at the profound challenges William Blake poses to both editors and readers. Despite the promises of the current multi-modal environment, the effort to represent Blake's works as he intended them to be read is increasingly being recognized as an editorial fantasy. All editorial work necessitates mediation and misrepresentation. Yet editorial work also illuminates much in Blake's corpus, and more remains to be done. The essays in this volume grapple with past, present, and future attempts at editing Blake's idiosyncratic verbal and visual work for a wide variety of audiences who will read Blake using numerous forms of media. Ripley's introduction attempts to tell the history of editing Blake from the perspective of editorial remediation. 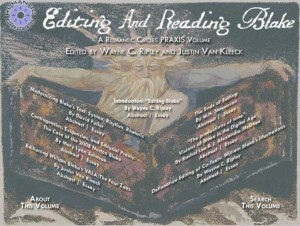 Essays by W. H. Stevenson, Mary Lynn Johnson, and David Fuller, all of whom have edited successful print editions of Blake's works, reflect on the actual work of editing and explore how the assumptions underlying editorial practices were challenged by publishers, new ideas of editing, new forms of technology, and ideas of audience. Recognizing that editorial work is never done, the volume also includes the indispensable errata to the 2008 edition of Grant and Johnson's Blake Designs. Essays by current and past project assistants to the Blake Archive, Rachel Lee, J. Alexander McGhee, Ripley, and Van Kleeck, examine the difficulties that Blake's heavily revised manuscripts, such as An Island in the Moon and Vala or The Four Zoas, and Blake's illustrations of other authors, have posed both to editors working in print and to the ever-evolving Blake Archive. Romantic Circles is pleased to announce a new volume in the Praxis Series: The Sublime and Education, edited by J. Jennifer Jones. The Sublime and Education offers a series of essays on how the concept of education intersects with sublime theory and Romantic aesthetics. Rooted in the critical philosophy of Immanuel Kant, this diverse collection engages comparatively with Romantic-era literature and cultural theory of the 20th and 21st centuries. One underlying inspiration is the pedagogical theory of Gayatri Chakravorty Spivak, who has thought widely about humanities-based training using Romantic-era texts as principal theoretical and literary tools, formative among them the aesthetic philosophy of Kant. Spivak's pedagogical theory can perhaps best be apprehended through the claim that proper pedagogy consists in "the uncoercive rearrangement of desires," which is to say a pedagogy founded on a notion of an immanent rather than a transcendental sublime. In complementary but nevertheless highly individuated ways, each contributor to this volume offers just this type of reformative work. This volume of the Romantic Circles Praxis Series includes an editor's introduction by J. Jennifer Jones; essays by Christopher Braider, Frances Ferguson, Paul Hamilton, Anne McCarthy, Forest Pyle, and Deborah Elise White; and an afterword by Ian Balfour.